Roses are a much-loved wedding blossom, symbolic of love and beauty. Available in a number of sizes, varieties and colors, roses are a popular flower choice for weddings—from centerpieces to bouquets and boutonnieres. For this bouquet series, Kelly Dolloff from Artistic Blossoms Floral Design Studio designed three beautiful bouquets at different price points that incorporate several types and colors of roses. Flowers and foliage pair to create a rustic and natural look. Olive greens, eucalyptus and plumosa are distinctly textural, while also providing a fresh pop of greenery. 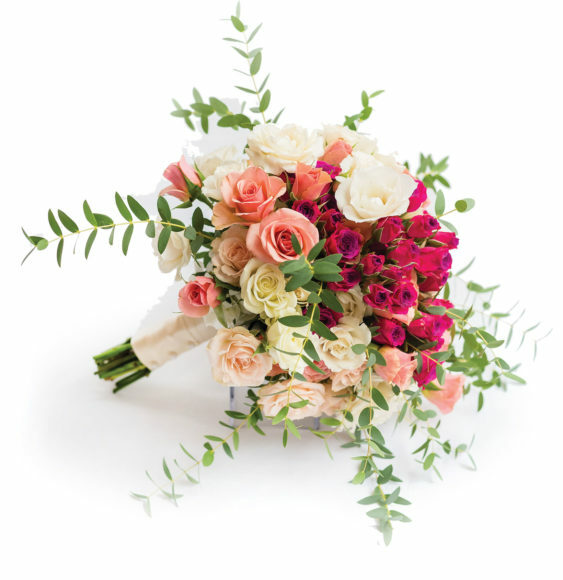 Pale pink traditional roses, Queen Anne’s lace, calcynia and freesia are classic blossom choices that add a romantic touch. This bouquet is packed with roses and plenty of color. Fronds of eucalyptus complement a tight mix of white majolica, hot majolica, and Ilse spray roses. Spray roses are known for their multi-blossom stems, which are miniature versions of the traditional rose. Their smaller size and many blossoms ensure a look that is both delicate and textural. A favorite among brides, wedding designers and Dolloff herself, garden roses (featured here) are lush and fragrant, and add elegance to any bouquet design. Compared to traditional roses, garden roses have a fuller bloom and open with layers upon layers of delicate petals, making them show-stopping blossoms. 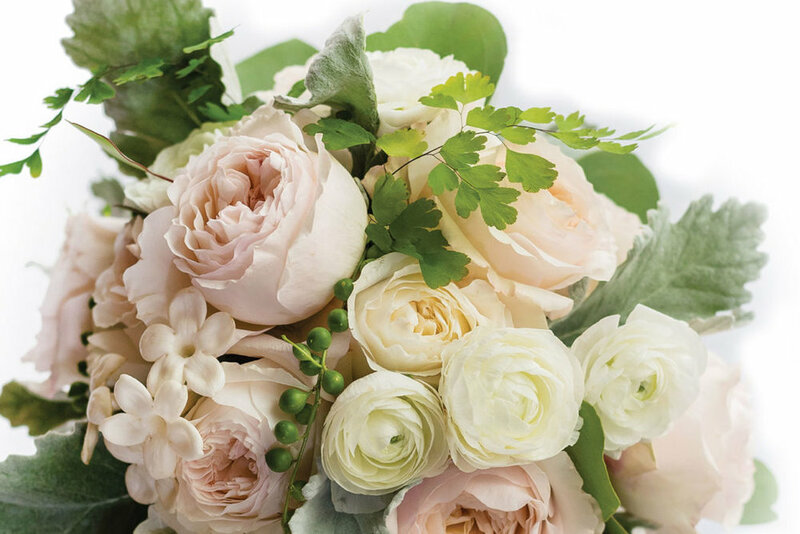 The blush garden roses in this bouquet pair perfectly with a stunning mix of white ranunculus, dusty miller, stephanotis, mother of pearl succulent vines and maidenhair ferns.